This year’s Vinexpo was clearly a tribute to the growing influence of the Chinese market. At the fair, signs written in Chinese were as frequently found as in English. Along the busy corridors of exhibitors’ booths, it wasn’t just the attendants that were from Asia but manning the booths, there were plenty of Putonghua and Cantonese speaking assistants ready to translate and assist in making business deals. At the finale evening, Fete de la Fleur, the decoration consisted of Chinese terra cotta soldiers gracing the entrance of the outdoor marquee for 1500 guests. The French menu was translated into Chinese as well as English. Vinexpo organisers said about one out of every three visitors were from Asia with Chinese making up the largest component. 2011 Vinexpo was announced a great success by the organisers with the show attracting 2,400 visitors and approximately 50,000 visitors. M Robert Beynat, CEO of VINEXPO, said: “The number of visitors from Asia exceeded our most optimistic forecasts. The Asian presence confirms our research on the outlook for world wine and spirits business”. 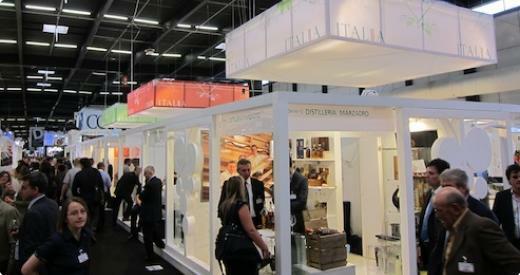 For the Asian Palate team, Vinexpo 2011 was a wonderful opportunity to connect with the global wine community. We enjoyed wonderful tastings, appointments, visits and food and wine pairing sessions. We look forward toVinexpo 2012to be held in Hong Kong May 29-31!